St. Andrews is my 2nd home. I’m so happy there. The golf, the history, the pubs, the people. No I didn’t mention the food. Four out of five ain’t bad… The “auld grey toon.” There’s no place like it. Most of St. Andrews’ offerings for lodging, like the Ardgowan Hotel, are very old 2-3 story buildings with cramped space and tough access through tight doors and stairways. They’re just fine, and most are located walking distance from the Old Course. The Fairmont Hotel offers something quite different than those old cramped rooms. Space. The Fairmont is a very large hotel a few minutes drive from the Old Course and about eight other courses. The hotel provides extremely spacious rooms and every amenity one might want or need when on a Scottish golf trip. The hotel is located on the Scottish coast, featuring fantastic views. The property occupies some 520 acres. The Fairmont offers several different types of accommodations: Standard rooms available with four different views, five different suite configurations, two family style rooms, and manor homes. Even the smallest offering, the standard room, has about 4-5 times the space of the smaller hotels in town. In fact, I’d venture to guess that the bathroom in my room at the Fairmont on my last golf trip to Scotland had more square footage than my room at the Ardgowan. From the robes to the heated towel racks in the bathroom, the standard room amenities are but a dream compared to the old town’s offerings. The manor homes, which I’d love to try out the next time I’m in St. Andrews, are stand-alone homes which are over 4,000 square feet. Perfect for a golf group. The Fairmont offers full spa treatments and unique packages which would come in handy after a long cold (yes it can be cold in Scotland) day on the links. Hot tub and pool. I’ll be here next visit to St. Andrews! I personally found the hot tub and swimming pool to be such a fantastic treatment for all the stiff muscles in my back and my aching lower body, a result of playing some 6-7 straight days of 36-holes. If you’ve never golfed in Scotland, there are no carts (buggies as they’re called in the UK). All golf is walked and the ground is as hard as Interstate 5. Your feet and knees WILL ache after a few rounds. Book it. After a long day of chasing the white spheroid, a good meal and a “wee pint” are in order. The Fairmont has numerous culinary offerings and plenty of great places to enjoy a splash of scotch or a wee pint of Belhaven Best, a local brew I’ve come to love. My group spent quite a bit of time in the Kittocks Den & Bar, celebrating our triumphant shots on the Old Course, and lamenting over the not-so-triumphant ones. Each morning the hotel offers a fantastic breakfast buffet fit for a king, or a monarch. Check your Scottish history on that one. The dining area for breakfast was the gigantic atrium area, seen below. I think I could hit a full sand wedge and not hit the ceiling in the atrium. Nearby golf courses include the Old Course, New Course, Kingsbarns, Castle Course, Srathtyrum Course, Eden Course, Jubilee Course, and Balcomie Links a short drive away. To supplement the property and the great local courses, the Fairmont has two on-site courses, the Kittocks Course and the Torrance Course. I had the pleasure of playing the Torrance Course (pictured below), a wee combination of Scottish and American golf architecture. A mere walk from my room at the Fairmont, the on-site courses feature fantastic views of the nearby sea and the town of St. Andrews. The Fairmont offers a different, more luxurious type of lodging and experience than the old salty rooms found in downtown St. Andrews. A far cry from a small room with a bed. The hot tub alone is worth booking the Fairmont. It was a life-saver on the achy bones, which walked over 100 MILES of golf the last week I was in St. Andrews. 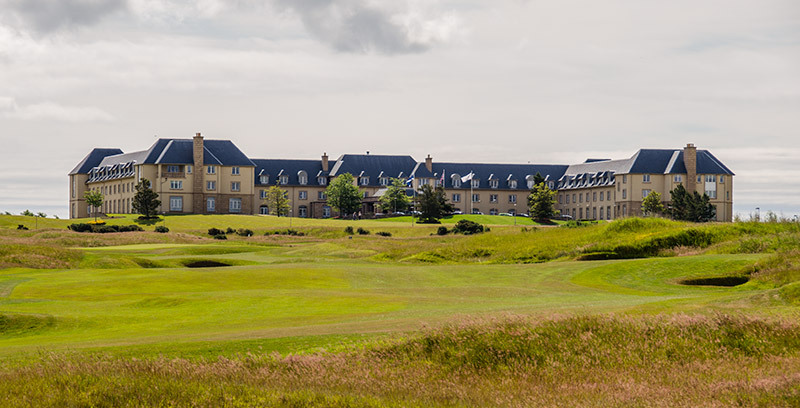 Fairmont St. Andrews photo gallery.